The MG TC Midget is probably one of the best known MGs to come out of Abingdon since the Second World War. As soon as the war was over the factory resumed car production after six years of producing tanks, armoured cars and aeroplane engines for the war effort. 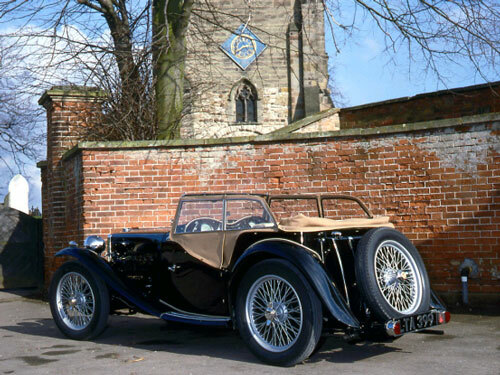 The basis of the new car was the pre-war MG TB, it was to have a similar engine and gearbox and axles, the only significant changes would be to the body which was widened by nearly 4" across the seats without changing the basic chassis, wings and running-boards or facia layout. The TC was improved in detail too, the sidescreens now had flaps to facilitate hand signalling, the electrical equipment was also updated with the twin 6 volt batteries removed from the underfloor position of the TB to a bulkhead box containing a large 12 volt battery. There were also changes to the suspension, hydraulic lever arm dampers were fitted and the road springs were mounted in shackles rather than the traditional sliding trunnions. This change allowed the use of war-proven rubber suspension bushes which gave smoother quieter feel to the car as did the fitment of rubber engine mountings. Otherwise it was exactly the same as the 1936 design of the MG TA which started the T series line. Within 5 weeks of the official end of the war in October 1945, The MG Car Company announced the TC Midget and by the end of that year had proudly produced 81 examples which was no mean feat as so many materials were in short supply, especially sheet steel. The car sold exceptionally well, a large number were exported to Commonwealth countries, particularly Australia and South Africa, which was not surprising as MGs had sold there in quantity before the war. What was surprising however was that there was immense interest in the United States and it can be stated that the MG TC was responsible for starting the American craze for the British Sportscar. Nearly 2000 cars were exported to the United States and Abingdon had deemed the potential sufficient to warrant the developent of a special North American model, still in right hand drive form but with chrome bumpers and flashing indicators. The effect that the TC had on America was unbelievable as it introduced the pleasures of sports car ownership to people who had never experienced it before and it opened up the market for many more imported cars to follow. One notable customer in England for the TC was the Duke of Edinburgh who owned one before marrying Princess Elizabeth, the future Queen, in 1947. Sales were going from strength to strength which saw over 1600 produced in 1946 rising to a peak of over 3000 during 1948. In total exactly 10,000 were produced between 1945 and 1949. Pressure was soon exerted by the Americans for an updated version of the TC and in 1950 Abingdon responded with TD in 1950. This car had an all-new chassis, with rack and pinion steering and independent front suspension, altogether a vast improvement with fairly dramatic styling changes, and the first in 13 years. Type: 10.97 hp in line water cooled. Valve operation: Push rod operated overhead valves. Compression Ratio: 7.5 to 1. Power output: 54.4 bhp at 5,200 rpm. Max Torque: 64 Ib/ft at 2,700 rpm. Transmission: Four speed manual gearbox, synchromesh on 2nd, 3rd and top. Suspension (front): Half elliptic springs, beam axle. Brakes: Lockheed 9" drums all round. Maximum speed in each gear: 1st - 22.6, 2nd 39.2, 3rd - 56.6, top 78.0. Fuel Consumption: approx 27 mpg. Road tax: £13 0s 0d.